A hand cream, enriched with shea butter and P.D.O. lavender essential oil from Haute-Provence, to help nourish and delicately perfume the hands. This shower oil transforms, when in contact with water, into a delicate foam that gently cleanses the body. Enriched with almond oil, it respects the hydrolipidic film and leaves a subtle and mouthwatering scent of fresh almond, for a delightful skin! Product Plus: this 2-In-1 shower oil offers dual benefits: it both cleanses and moisturizes, and is suitable even for dry skin. Gifts she'll love From L'Occitane! 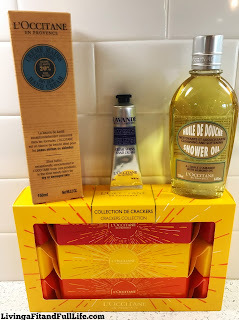 L'Occitane definitely has some amazing products worth trying this holiday season. I absolutely love their Three Mini Cracker Trios because not only are they adorable but they make the perfect gift for others! I have three sisters so gifting them each one of the Mini Cracker Trios works perfectly and I know they'll love them because they contain amazing products from L'Occitane! L'Occitane's LAVENDER HAND CREAM smells heavenly and moisturizes like a dream! It absolutely perfect for winter as my hands always seem to dry out due to the colder weather and my increased hand washing to try to avoid sickness. It instantly soothes my dry hands and helps them to look healthy and moisturized. This hand cream makes the perfect small gift or addition to any gift bags you may be making. SHEA BUTTER HAND CREAM from L'Occitane is another amazing hand cream! I love that it's not overpowering with fragrance for when you just want a good hand cream without all the scent. It still smells nice and moisturizes like a dream. It's the perfect way to keep hands moisturized while on the go or at home! ALMOND SHOWER OIL from L'Occitane is probably one of my favorite products from L'Occitane! It feels incredibly moisturizing and leaves my skin looking amazing. After using this Almond Shower Oil my even seems to look younger as moisturized skin always seems to look younger. I also love how well it cleanses my skin without drying it out! It's my new favorite way to cleanse! Click HERE to find a store near you that sells L'Occitane! Click HERE to learn more about L'Occitane! Follow L'Occitane on social media!